With an endless array of pristine landscapes and animals that are native to no other region in the world, the country of Madagascar—located in the Indian Ocean—draws in hundreds of thousands of tourists every year from nearly every country in the world. But beyond the images of lemurs and baobab trees that were made famous in the 2005 animated film Madagascar, the African nation of over 25 million people continues to be among the world’s leaders in health, educational and economic disparities on a yearly basis. Unbeknownst to many, the island of Madagascar is one of the most racially diverse countries in the African Union, with historic and modern migratory flows from countries throughout Southeast Asia, India and continental Africa. Some anthropologists believe that settlers from Southeast Asian regions arrived to Madagascar over 1,000 years ago. Still, despite the diversity that Madagascar often prides itself on, anti-black racism is an endemic aspect of Malagasy culture and is visible in advertising campaigns throughout the country that consistently favor lighter-skinned people of Southeast Asian descent over darker-skinned models. As part of an ongoing, collaborative portrait series with filmmaker Jordan Thierry, titled The Black Fatherhood Project, I traveled to Madagascar during July and August to explore the ways that blackness and masculinity are conceptualized throughout society. In a country that understands race beyond the common black-white U.S. racial binary, it was common for Malagasy people to simultaneously disregard the concept of race and denigrate blackness as unattractive and undesirable. As a result, conversations about black masculinity are often relegated to the periphery of society and consistently obscured by notions of identity that are shaped around celebrating a historic Southeast Asian immigration wave, rather than the country’s blackness. 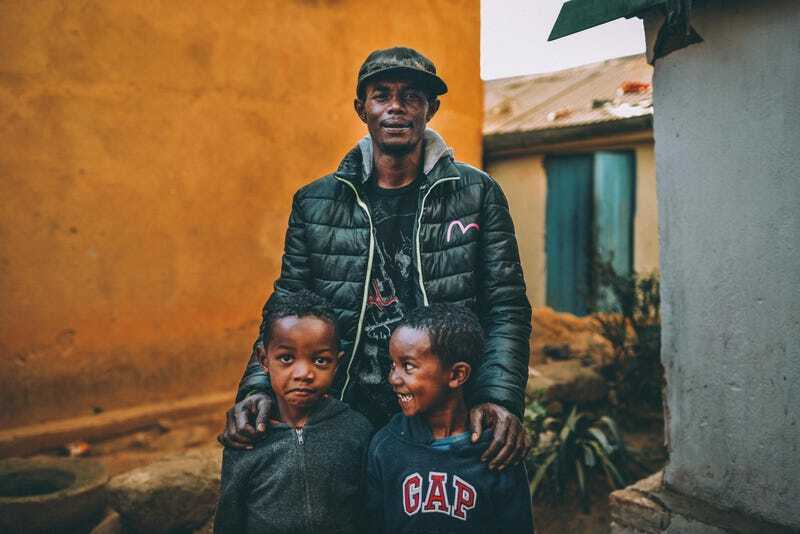 Each father in this experiential photo series was born and raised in the capital city of Antananarivo, located on the island’s central highlands. They work in a variety of occupations, including agriculture, machinery and fishing, and range in age from 19 to 54. Parany, a 36-year-old taxi driver, shared similar views but also said he believed that being black and a father in Madagascar came with more disadvantages than advantages. “Black fathers also love their children the way light-skinned people love their children,” he said to me one evening while we watched his 8-year-old child play soccer with his friends. Although the fathers I met often challenged popular conceptions of masculinity by openly exhibiting tender interactions with other men, child-rearing in the capital city was entirely gendered. Women often remained at home and tended to their children, while their partners or husbands would assume financial responsibilities. The portraits in this series are a reflection of the interactions I would observe every evening. They are an attempt to capture the love and compassion that I would observe between fathers and their children during my early-evening walks. Each portrait is an attempt to insert images of black fatherhood that are not readily available in Madagascar. One of the images in this series features a father who is walking with his child on his shoulders. He would rush home after work and immediately place his son on his shoulders and parade him throughout his neighborhood. Another father, Patrick, a bricklayer, would take his son with him to the nearby rice fields while he tended to his crops. He spoke to me of a world where he could provide everything he never had when he was his children’s ages. Walter Thompson-Hernandez is a multimedia journalist whose work has been featured on NPR, BBC, Fusion, BuzzFeed, VICE, and others. He is currently creating content for We Are Mitú.